A new British report concludes that e-cigarettes are a blessing rather than a curse, arguing that the potential health benefits greatly outweigh the risks. It’s a position that runs in stark contrast to the dire warnings put out in the United States. 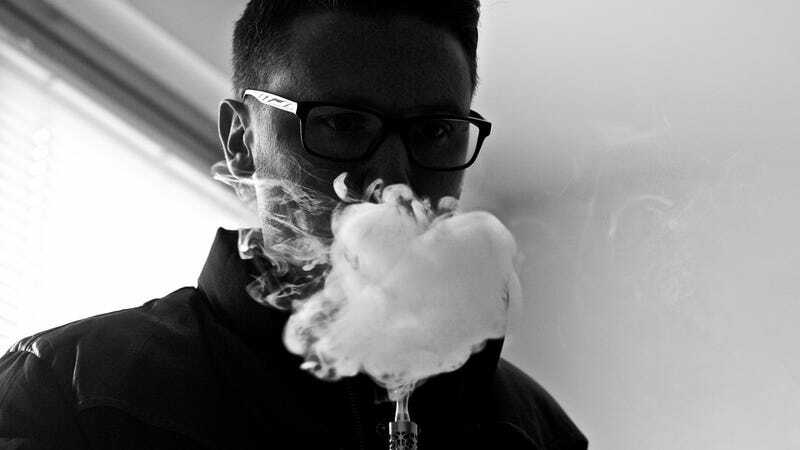 After taking a look at the growing body of scientific evidence, researchers at the Royal College of Physicians (RCP) have concluded that e-cigarettes aren’t quite the devil’s tool that many are making it out to be. In the new 200-page report, the researchers conclude that, for all the potential risks involved, vaping has a “huge potential” to prevent death and disability from tobacco use, and it could “hasten our progress to a tobacco-free society.” What’s more, the report concludes that vaping probably involves a certain degree of harm, but these risks are “substantially smaller” than those posed by conventional tobacco smoking. Indeed, the report is a stark reminder of just how unhealthy tobacco smoking really is. According to the RCP’s figures, half of all lifelong smokers die prematurely, losing about three months of life expectancy for every year smoked after the age of 35. That’s usually about a decade’s worth of life gone up in smoke. The risks of vaping, the researchers argue, aren’t even in the same ballpark. At the same time, the RCP says that e-cigarettes are not a proven “gateway” to smoking, and they’re a proven means of helping with smoking cessation. These guys, in my view, are going off a cliff. They are taking England into a series of policies that five years from now they all will really regret. They are turning England into this giant experiment on behalf of the tobacco industry. In response to the RCP report, the US Centers for Disease and Prevention said there’s “no conclusive scientific evidence supporting the use of e-cigarettes as a safe and effective cessation tool.” Yet the new British report presents evidence showing exactly that; a recent study showed a 50 percent increase in the chances of success when vaping is used to help people quit smoking. Kenneth E. Warner from the University of Michigan Public Health told the Times that the UK and the US now have “diametrically opposed” positions on the subject.